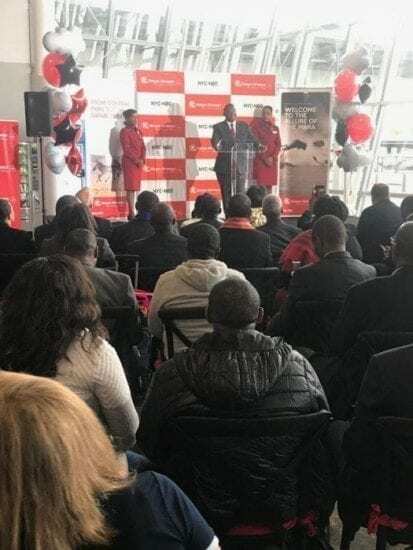 NAIROBI, Kenya, Oct 29 – Kenya Airways Boeing 787-8 Dreamliner from Nairobi to New York has landed at the John F. Kennedy International Airport. The plane, which was received by a ceremonial water salute, landed a few minutes to 3pm ETA carrying 234 passengers from the Jomo Kenyatta International Airport. The long-haul flight lasted 15 hours, reducing the journey by over 7 hours. The new route is expected to increase trade with the US and boost tourist arrivals from North America with the government projecting that it will bring in more corporate and high-end tourists. Kenya Airports Authority says the direct flights to the US will further cement JKIA’s position as one of most strategic airports in Africa as well as increase air traffic to the region. Besides Kenya, Cape Verde, Egypt, Ethiopia, Nigeria and South Africa are the other African countries with the Category 1 access to the US. Meanwhile, the Kenya Civil Aviation Authority and the US Federal Aviation Administration have signed a new training agreement that will see the East African School of Aviation become an FAA training Centre in Africa for teaching Flight Safety Inspector courses.